The Gala Dinner was a fitting culmination to an extraordinary weekend of tastings and events dedicated to the glories of Burgundy. Guests were seated alongside winemakers at long, communal tables that paid homage to La Pauleé’s origins as an after-harvest celebration. In keeping with tradition, diners brought wines from their own cellars to share with friends and fellow table mates. 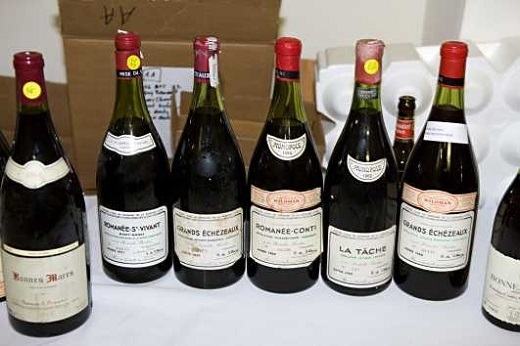 The number of exceedingly rare bottles that made the rounds was truly breathtaking. 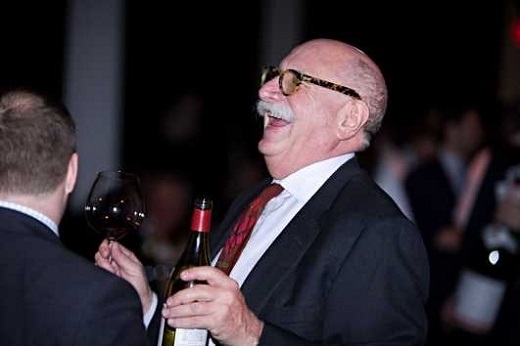 All of the wines were meticulously served by the finest sommeliers in the country, no small feat considering the hundreds of bottles of wines that were opened, tasted and ultimately drunk. The multi-course menu was prepared by a world-class team of chefs that included Daniel Boulud (Daniel), Michel Troisgros (Troisgros), Paul Liebrandt (Corton), Grégory Pugin (Veritas) and Thomas Preti (Events to Savor). 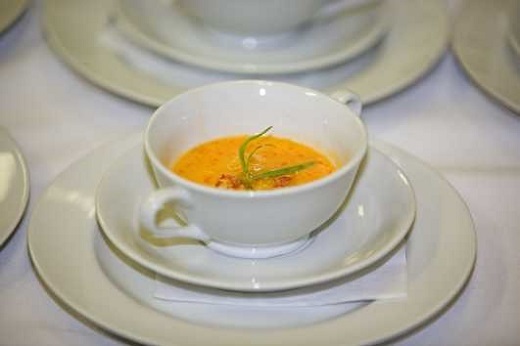 The highlight of the Gala Dinner was Chef Pugin’s profound Lobster Nage, which was even better at La Paulée than it was when I had it at Veritas a few weeks later! I also adored Chef Liebrandt’s Foie Gras with Beet-Hibiscus Gelée and Blood Orange, which was incredibly delicious. Any of these dishes would have been perfectly at home in the world’s top restaurants; that they were so skillfully prepared for 300+ people is truly amazing. We were very fortunate to have John Ragan, Wine Director at Eleven Madison Park, one of New York’s very finest restaurants, as the sommelier at our table. Cédric Bouchard’s 2004 Blanc de Blancs Haute-Lemblée was a great way to start the night. Soaring aromatics melded into sublime layers of perfumed fruit as this supremely elegant wine opened up in the glass. This remains one of my favorite Champagnes of the last year. Among the whites, I was especially taken with a Lafon’s 1991 Meursault-Charmes and Meursault-Perrières which were models of elegance and precision. The Perrières had a touch more minerality and freshness, but both wines were extraordinary. Coche-Dury's 1994 Meursault Rougeots was rich, expansive and sweet. Ramonet’s 1999 Montrachet was floral, minty and spiced, with tons of energy and vibrancy. It was superb. Leflaive’s 2001 Bâtard-Montrachet (magnum) was intensely sweet, layered and pure. Served alongside the Lobster Nage, it was pure magic. The estate’s 1999 Puligny-Montrachet Clavoillons was a much simpler wine by comparison, but its soft-textured generous fruit was impossible not to love. Domaine de la Romanée-Conti’s 1993 Montrachet was a rather shy, introspective version of this wine, but offered tons of balance in a supple style. Ramonet’s 2004 Bâtard-Montrachet was another wine endowed with staggering energy, focus and brilliance. It was simply majestic. The 2006 Puligny-Montrachet Folatières from Leflaive was layered, rich and weighty, with tons of character, while Sauzet’s 2006 Puligny-Montrachet Referts showed more of a flinty, mineral-drivern personality. Both were beautiful. Domaine de la Romanée-Conti’s 1973 Montrachet was all bacon fat, minerals and smoke. It was an intriguing bottle, but a bit past its peak for my taste. A bottle of de Vogüé’s 1999 Bonnes Mares (from my cellar) was corked, which was heartbreaking as the wine was otherwise intact and full of fruit. Méo-Camuzet’s 1985 Vosne-Romanée Aux Brûlées was deeply spiced, with pretty layers of perfumed fruit. Mugneret’s 1985 Clos de Vougeot was more advanced in its minty, floral red fruit. Still the wine showed lovely depth considering its age. The 1915 Gaunoux Pommard Grands Epenots was quirky and unsual, to say the least. The wine revealed tons of fruit in a rich, earthy style that made it impossible to believe it was only Pinot and/or 80+ years old. The 1999 Bonnes Mares from Domaine D’Auvenay was intoxicating for its sheer richness, concentration and purity. The wine’s balance and length were head-spinning. Imagine my surprise when I came back to my table and found a generous glass of Domaine de la Romanée-Conti’s 1978 La Tâche (methusaleh) waiting for me! This was a monumentally structured, dense and full-bodied wine loaded with flavor, exotic spices and personality. The 1952 Romanée-Conti (jeroboam) was even better. This youthful wine revealed incredible clarity and precision, with a long, eternal finish that I won’t soon forget. The 1985 Roumier Bonnes Mares (magnum) was another gorgeous, sweeping wine loaded with perfumed fruit. This magnum was a remarkably fresh, vibrant example of 1985 Bonnes Mares. Mugneret-Gibourg’s 1995 Echézeaux offered up lovely purity to its fruit with notable power and focus. I couldn’t resist bringing a few gems from Piedmont to mix in with the Burgundies. Bruno Giacosa’s 1964 Barbaresco Riserva Santo Stefano showed beautifully in this context, with endless layers of perfumed fruit. It was great to see the expression one people’s faces when they saw the name of the wine they had just tasted. One person, whose palate I respect immensely, was sure it was a wine from Domaine Leroy! Giacomo Conterno’s 1971 Barolo Riserva Monfortino was extraordinary for its power and the sheer integrity of its fruit. It was a truly remarkable example of one of the world’s icon wines. With that, another great Paulée had come to a close, but not before a number of monumental bottles had been enjoyed with some of the most sumptuous food on the planet in the spirit of friendship, generosity and camaraderie that the great wines of Burgundy inspire.